For Christmas I decided to take the “Crud in My Craft Room Challenge” to the next level. I tried to make most of my kids’ gifts using things I had around the house. I know, I am a total nerd. I blame it all on a odd mix of passion for the environment (reduce, reuse, recycle) and an aversion to spending money. Luckily my kids are still young enough to still think I am cool. My daughter really wanted a “pink” bean bag chair, so I was able to make this one for absolutely FREE! I put it together using stuff I had hoarded in my craft room. If you know me, my house is super tidy, but don’t go in my craft room! A few months ago a friend of mine had given me a sad and dilapidated bean bag chair that she didn’t want anymore. It was vinyl and ugly, but I knew it would make for a great base. If you have always been intimated by reupholstering something, reupholstering a bean bag chair is a great place to start. 1) Get some lightweight clear plastic drop cloth. 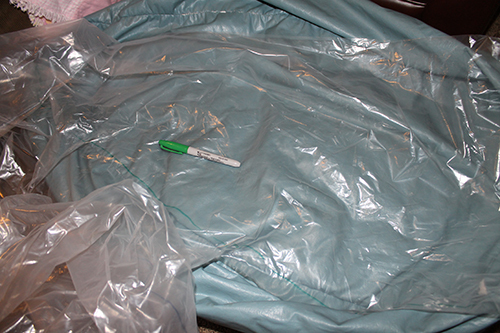 Hold it over the bean bag and trace one of the panels onto the drop cloth with a sharpie. Because it is clear you will be able to see where the seams are to trace the panel. But you may need to flatten it out a bit. Lucky my bean bag chair was already pretty flat, so it wasn’t hard to do. I then added about a quarter inch of wiggle room to it so that the cover was just a tad bigger than the original chair. I also traced the bottom and top circle panel. 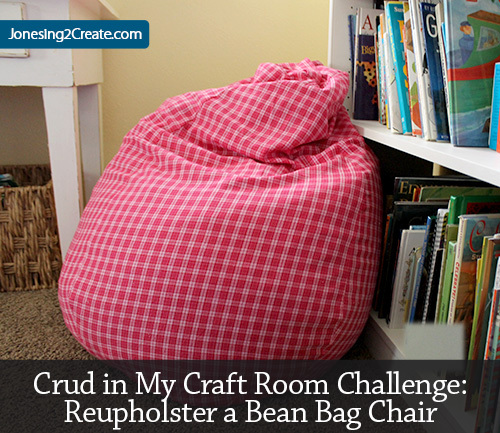 It doesn’t have to be perfect, because a bean bag chair is usually a little baggy anyway. 2) Cut out your pattern on the drop cloth and use it to cut out the panels from your fabric. On the bottom circle I knew that I wanted to put a zipper in it. So cut the circle in half and added about a half inch to the flat side when I cut it out. This gave me some fabric for the seam around the zipper. I also cut out a handle for the top so that it would be easier for my daughter to drag around. To make the handle I just cut out a large rectangle and folded it so that the seams weren’t showing and then stitched down either side. I made the handle a little longer than the circle was wide so that I would have room for a button hole on either side. We will use these later to secure the old bean bag inside the new cover. 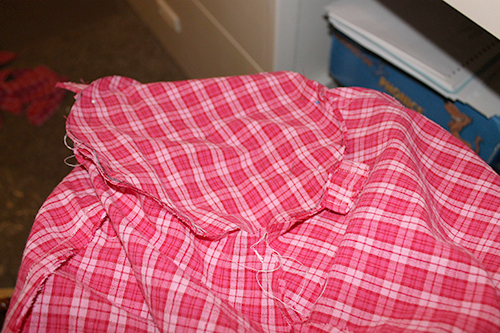 Luckily I already had some pink fabric lying around that I haven’t used for years, so I didn’t even have to buy fabric! 3) First sew your panels together along the sides, leaving room on the top and the bottom to add the circles later. You will end up with a kind of tube that is narrower on one side and wider on the other. 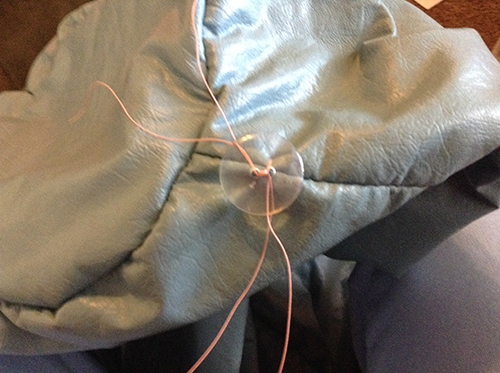 4) Sew on the top circle by pinning the panels around it. If the hole isn’t quite the right size you may have to sew up further on the panels or let some seam out. I also sewed the handled in at the same time by laying it on top of the circle. Before sewing it on, make your button holes. I cheated and cut two slits for the holes and then sewed back and forth by the beginning and end of the hole so that the holes wouldn’t tear open more. I hate doing button holes and refuse to do them. 5) Add the zipper to the bottom circle. I am not a big fan of zippers either, but this zipper tutorial made it easier. Thanks Melissa Q.! 6) Sew the bottom circle on the same way you did the top circle. 7) Take the original bean bag and sew two large buttons on the top about where your button holes will go. 8) Now it is time to “dress” your bean bag! Unzip your zipper and reach in and grab those button holes. Then secure the top of the cover to the top of the bean bag chair using the buttons. This will keep things from sliding around. 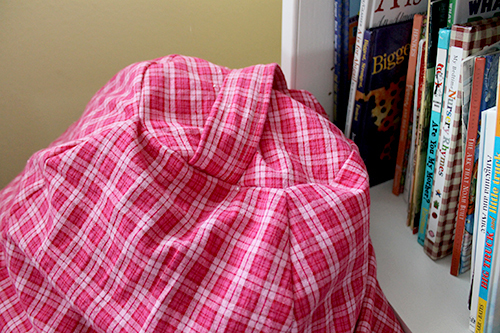 9) Gradually stuff your bean bag chair into the cover. This may take some time depending on how big your zipper is. You may have to take out some stuffing if our bean bag chair isn’t as flat as mine was. 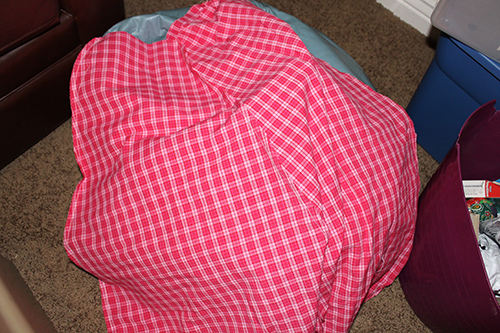 10) Once you have the bag all in, unzip the original bean bag chair, and add some more stuffing. Don’t do it before you put on the cover because you won’t be able to fit it through the zipper. I didn’t feel like buying more of those little Styrofoam balls, so I cut up some old foam into small squares. The foam was from an old, broken IKEA couch that I stripped before getting rid of it. So far I have made several benches, throw pillows, and a bean bag chair from its remains. 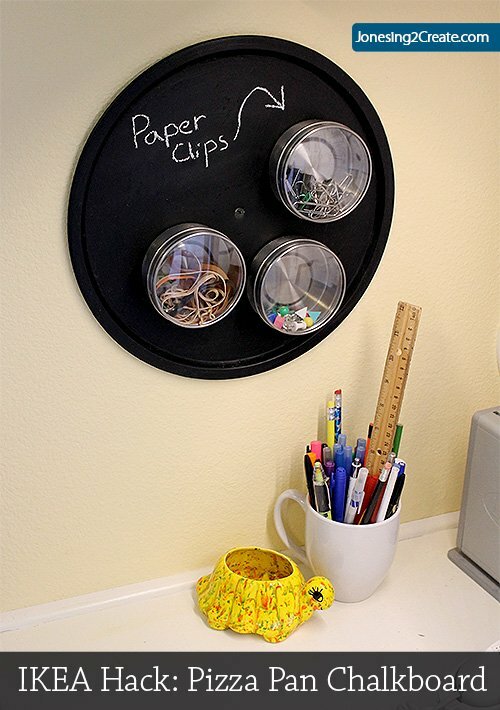 I figure it is less stuff in the landfill and less money spent at Hobby Lobby! The best way to cut up foam is with a turkey carver. See my tutorial on how to cut up foam. But if you don’t have any foam, you can also use the stuffing from old pillows or grocery bags! 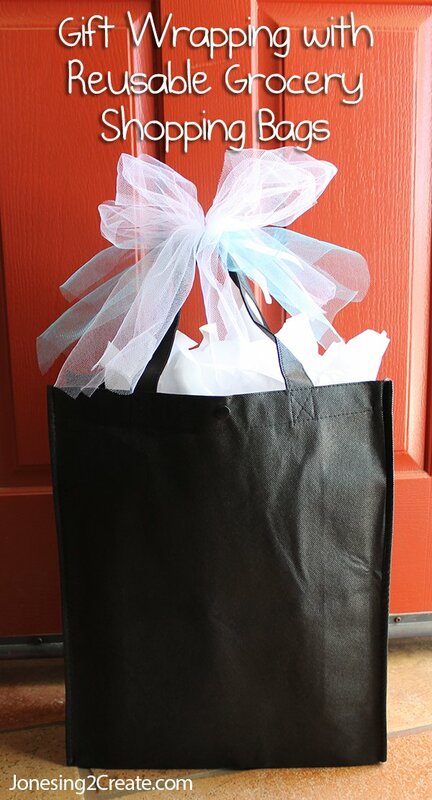 If you use grocery bags, I would sew the zipper closed in case little ones decide to try to get into it. Once it was full, I zipped both zippers back up and it was all ready to go! My little girl loves it and it is fun to watch her drag it around the house.